With the Eagles second preseason game on the horizon, offensive coordinator Marty Mornhinweg met the media to discuss the progress of the young Eagles offense. Mornhinweg also touched on running backs LeSean McCoy and Martell Mallett, Clayton Harbor being the No. 2 tight end and Chad Hall’s impressive camp. "Good camp so far. We have a good test coming up. The fellows are working hard putting in the time and the preparation in the classroom. We'll open it up to questions." "Well, our mentality is that we want to get better every day. But, first you have to be in excellent physical condition to do that. Otherwise you get into a survival mode and the fellows came into camp in shape and for the most part we've gotten better every day. We've had to step back on occasion to get better, but we've done that and I'm real happy so far. Now, when we go home in a couple days here, it's still going to be training camp and it's going to be that mentality. So, we still have a long way to go to get to where we want to be." "I think you said it right there, we are young and inexperienced. However, I do think we have excellent talent on this football team. So, that mindset comes into play, big and [Wide Receivers Coach] David Culley and his receiver group have done it year after year. If you remember [WR] DeSean Jackson came in, started as a rookie immediately, great year and then [WR] Jeremy Maclin last year, rookie. We have great teachers here coaching positions. They're just fantastic coaches. So, that part is important and then that mindset that a player has to have. There's no substitute for the hard work and preparation, there's just none. They have to put that part in and then they have to get the work in on the field, as well - in the classroom and on the field. And then, a little bit of it is just a little bit of fortune. They have to stay healthy. So, if you come into camp in great, great shape, then you have a better chance of doing that and all of those things have worked for many rookies. So, we're expecting it to continue." "Yeah, any quarterback you encourage that. Half the time, approximately, now it's a little cyclical depending on which year it is. But, the five-plant throw, five-hit throw, seven-plant, seven-hit, that's about half the time. The rest of the time you're forced to move. Now, it may be as subtle as a slide right and throw right, or slide right, throw left, slide left, throw left. It may be as much as a front door, back door, or up and out, maybe a full scramble. So, about half the time a quarterback's moving in this league and with some of the things we do. So, it's really important that a quarterback have some pretty good feet and manage that pocket just a little bit." "Oh sure, yeah. He's a fine athlete. He has good feet, deceptive speed, and throws on the run really well and makes decisions. His decision making on the edge is pretty good and even hitch, hitch and then go, and then you throw it or run it. He's pretty good that way, or has been in the past, up to date." "There are a lot of different factors that go into a regular season game, a league game, a lot of different factors. In the preseason it's a little bit different because there are some things we won't show and there are some things we that really want to take a look at with Michael and that first unit. So, it's pretty basic right now. Once you get into a league game, it's kind of the opposite. Once you get into a league game there are many, many different reasons and we want to put our football team in a position to have some success. Now, it's kind of opposite because preseason games are really even harder to prepare for with all the position coaches, let's say on offense because we want to see all these young men, these players, we want to see one of them do this, and this. We want to see another one do this, and this. We want to see another one do this, and this. We want to see this man with the first unit. We want to see this man with the second unit, and so, it's even more time consuming for a preseason game that way. Now, with Michael it's pretty simple that way and in a regular season game, there are many, many different reasons." "No. I don't concern myself with that. In a league game, our players have that mentality that we don't care who scores, how we score, run, pass, who gets the credit. We don't care about any of that. We're going to do whatever it takes to win the next ballgame. So, Kevin Kolb has that mentality. Now, you talked rhythm just a little bit and that's real. But, if you have that mentality 'we're going to do whatever it takes to win', then the rhythm is there, you get a little break for 40 seconds, and typically you're back in, and you keep your rhythm. I understand that question, but we have that mentality, and so, there are no issues there." 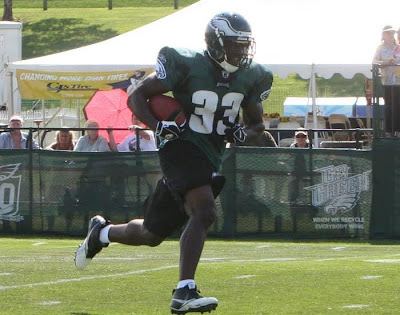 "Well, I'm not going to get into details, but there were a couple specifics things that LeSean wanted to do and (Running Backs Coach) Ted (Williams) wanted to see from him and he got those accomplished. So, that's a good thing. Otherwise, he's very comfortable, he's in tip-top shape, excellent shape, and fairly healthy - he's got the quad, but it's just a contusion. So, I think he's fine there, and he looked good this morning. He's had a fine, fine camp." "That's a good thing and that certainly is something we wanted to see." "There's no question there. You can compare this year and last year just a little bit, and he was just at this point really, right in the middle of a big learning curve. We do a lot of adjustments and calls. It gets quite complicated up front with the backs, and tight ends, and the line regarding protection. So, there comes a time where it becomes very simple in your mind and he's to that point now. It's night and day protection-wise and he's a good, physical guy. So, the physical part and the technique, he's in good shape there as well." "Mallet's a fine football player, as you know, rookie of the year up in Canada. So, we knew that he had some skill and ability. As you know he was gone for a few days and then we brought him back because we wanted to see him in a competitive atmosphere in a preseason game, and he showed very well. He's, again, a rookie right in the middle of the learning curve, pretty sharp, pretty smart guy now, and so, he's progressed very well up to date. He's got a long way to go, but he's progressed very well. He's been impressive. He's been impressive in camp." "We know a little bit about what he can do. He was a fine, fine ball carrier coming out of LSU. He can play both halfback and fullback. 99% of his work here, right now, is on that fullback spot because that's a new position for him and he's doing a fine job. There are a couple things we've discussed that I want to see out of him in this next ballgame. However, he's done a fine job up to date. He has a long way to go just like all of the young guys, but he's doing a fine job. He can also play halfback. He has the skill and ability to do that and there's no question about that. So, he's a versatile guy as well in a different way - we talked about Hall - so he may very well help our team with his versatility there." "Yeah, and coming out of college, Missouri State, it used to be called Southwest Missouri State I believe, he was a physical guy. So, the guys that are physical and will hit you tend to have a pretty good chance to progress very quickly and that's what he's done. Now, he's working really hard, diligently with the fundamentals and the techniques with how (Tight Ends Coach) Tom Melvin wants him to do it. And so, he's in that mindset that he's going to do it exactly as Tom coaches him every play and then I think he's going to be in great shape because he's a physical guy and he will hit you. So, that's a good thing." "Well, I just don't feel comfortable going there quite yet. He has a long way to go. He's had a terrific camp up to date, and we just talked about him, he's a tough, physical guy that will hit you. So, he's got a chance to progress and he's progressed very quickly. Now, there's a long way to go to be in a regular season game and be effective. So, there's his challenge and he's got a great opportunity right in front of him." "He's banged up a little bit. He progressed very well, then all of a sudden he's banged up just a little bit, and so, when he's healthy Tom Melvin will get him going again and Tom's an excellent, excellent teacher." "He's a little bit bigger than people would think. He's strapped together pretty good. He's a little shorter than people would think and he's very quick. He's very fast. He's a natural type of player, great hands, he can run the football, so he can do all of those things. So, a defensive group would have to make some decisions on him when he's in the game. If he goes into the game, for let's say a fullback, or a halfback, do we play nickel, or do we play base? And then all of a sudden he's out in the slot or out wide, or if you're playing nickel then he's in the backfield. So, it puts a little heat because of his versatility on a defensive unit." he's a little shorter than people would think. I just don't know what to think!